Congo Siasa: Elections: Can the opposition still unite? Correction: There are only 11 presidential candidates. Ismael Kitenge did not register. 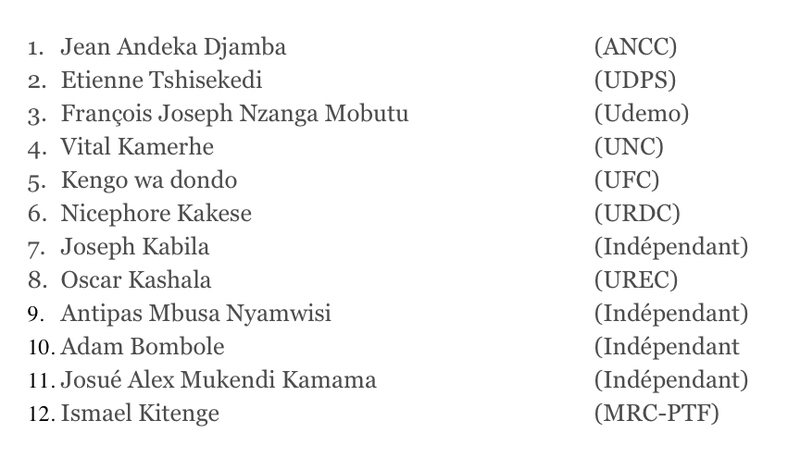 As most readers will know by now, there are twelve candidates for the presidential elections in the Congo. This is many fewer than in 2006, when 33 Congolese vied for the position, but for many in the opposition, this is still far too many. As I have argued here before, the presidential vote will, first and foremost, be a referendum on Kabila's popularity. If the president, for example, knows that he can garner 35% of the popular vote, then he needs to focus on making sure the remaining 65% is divided among enough candidates that no single one can beat him. That was the importance of the constitutional revision earlier this year, that changed the presidential poll from a two-round, majority-wins election to a one-round, plurality-wins affair. This means that the main challenge for the opposition will be to unite behind a single candidate in order to increase their chances of beating Kabila. This endeavor, however, has butted up against the considerable egos of those involved, as well as deep mistrust within the opposition. The opposition has now split into two major wings - the Fatima wing, led by Tshisekedi. He has been able to muster the support of 80 political parties other than his own UDPS, although none of these parties, to my knowledge, has much of an electoral base. Talks appear to have more or less come to an end between Tshisekedi and the other major opposition candidates. "The negotiations are finished," the veteran opposition leader said when he submitted his candidacy. His spokesperson added: "I am sure that our friends will join us." Those friends, however, have formed their own wing, an informal coalition dubbed Sultani, and led by Léon Kengo wa Dondo and Vital Kamerhe. In private, members of those parties are not optimistic about uniting behind Tshisekedi, who they claim has been leading with his chin by boldly refusing any negotiations. And even within this coalition, there are troubles - Kengo has been telling his colleagues that Kamerhe may rally behind him in exchange for the prime minister's position. Kamerhe says this is not true, and indeed it is not clear why Kengo, who has been a sly political player but has little mass following, should take the lead. Other, smaller players, may yet further divide the opposition. Adam Bombole, a rich businessman and former head of the MLC's Kinshasa section, has thrown his name in the hat. According to MLC sources, Bombole spoke with Jean-Pierre Bemba and received his provisional approval to run, but then didn't take the care to consult with other MLC leaders (not in prison) before announcing his candidacy. The result: He has been expelled from the party. Nonetheless, Bombole has relatively deep pockets and is popular in Kinshasa, where he could get votes. 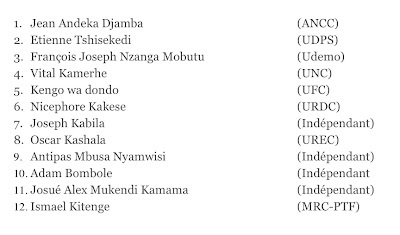 The only other two of the twelve candidates who could get more than one or two percent of the vote are Mbusa Nyamwisi and Oscar Kashala. Mbusa, who decided to run as an independent instead of for his RCD-K-ML party, still has something of a base in North Kivu among his Nande community, although many have jumped ship there, as well. Kashala came in 5th in the 2006 elections, with 3,4% of the total vote. However, the US-based doctor benefited then from Tshisekedi's boycott, allowing him to claim many votes in the Luba community and in Kinshasa. With this proliferation of candidates, it is no surprise that allegations have emerged that some are fake opposition members, running in order to divide their ranks and allow Kabila to win. Kamerhe and Kengo have been accused of this, and now Bombole and Mbusa have earned this dubious distinction, as well. I even heard a Kengo supporter suggesting that Tshisekedi's advisors have been bought off and have steered him in the wrong direction. Of course, it is still theoretically possible that (a) the opposition will unite, at least a little; and (b) that even divided, one of them could beat Kabila single-handedly. The president, however, has formidable resources: deep pockets, state media and the security services. Already, opposition members are complaining that they barely had the funds to pay for the registration of all of their legislative candidates, and there are reports that some of the main opposition parties have only been able to field candidates in a fraction of the 169 electoral districts. The next weeks will be interesting. Two things to watch: Will there be any further consolidation of the presidential field? My guess is that this would happen before the official campaigning begins in October, when candidates start spending much more money. Secondly, who are the different parties' legislative candidates? This last question will be important for any negotiations within the opposition, as it will have a bearing on who is projected to control parliament and thus be able to nominate the prime minister. It has now been confirmed there are 11 ccandidates and not 12. No female candidate to the presidental this year and Ismael Kitenge is the one missing from CENI 11 candidates list. Thanks Jason for this post,very interesting to read as usual, though I believe that you, like many of our well-meaning Congo friends (especially those that only become interested in our country these last ten years), fail to grasp or overlook this fundamental reality: the Kabila vote itself may also be split - not only the anti-Kabila one as many seem to think. For example, as things stand now with the current geopolitical electoral tendencies, Kamerhe performing strongly would be bad news for Kabila and good news for Tshisekedi, and vice versa. Although you recognized in your option (b) that one oppositionist candidate can single-handedly beat the incumbent president, I know from your previous postings that you actually are more inclined to believe that unless the opposition agrees on a joint ticket, then they will fail dismally - you're entitled to your opinion. But as a Congolese on the ground, I can tell you that this notion that if the opposition is divided they will soon, looks bizzare for many of my fellow countrymen. Yes, Kabila will likely win this election if the latter passes off like an ordinary election. Not, if the majority of the Congolese people all of sudden develop the sense that this is an historic election, or a "defining moment" like Obama likes to put it. Who would YOU vote for Jason? @Anonymous - I do still think that an opposition candidate could win, even if there are 11 of them. I do think that Tshisekedi and Kamerhe together would stand a much greater chance than either of them alone, however. Could opposition candidates eat into Kabila's "base?" Sure. But the point I am making is that, like in 2006 when Congolese "discovered" Bemba and threw their weight behind him at the last moment because he was carrying the flag of the opposition, I think today most Congolese back the opposition (outside of the core UDPS supporters) primarily because of their dislike for Kabila. I don't think, for example, that Bombole is going to grab voters away from Kabila, or that Mbusa will do so in the East. I am not making any predictions - I still think anyone can win. I just think it is less likely for the opposition to win if they are divided. @Brad - I am not Congolese, and for purposes of impartiality, I am not going to endorse any candidate. Unfortunately, this is not like the New York Times or Economist giving an endorsement - taking sides here would be seen by many to seriously compromise my objectivity, even if that is not the case. Great post as per usual, Mssr Stearns. I must say though that having travelled a good deal of the Congo during the month of July until just last week, there are more unknowns here than simply the particular configuration of the opposition, where each candidate has strength (either alone or in combination), and the depth of anti-Kabila sentiment. This is the Congo, after-all, and anything is possible. What I think “Anonymous” seems to be saying and what, perhaps, you are ignoring is the degree by which average Congolese come to understand what is at stake in this election, their access to objective information about all of the candidates, and what they will do with that information on Election Day. Similar to the use of facebook with Obama in 08’ (who’s cofounder is a friend and was O’s director of online organizing), there is something rather new that allows a broad swath of the populace to connect to each other and that provides information that did not exist in 2006. Namely, Radio Okapi. From my conversations with its editors, the UN-controlled station will soon began broadcasting to its now daily 27 million listeners a steady drum beat of election news, interviews with candidates, forums for listeners to call in and discuss them and the issues, and debates with the candidates themselves. It goes without saying that some of these candidates have more dexterity in the spoken word than others, are more conversant in all of the Congo’s languages than others, and it is thus quite possible the more skilled among them will use this platform to their advantage. Should this happen, we may see something akin to the Nixon-Kennedy debate, where the previously more “experienced” Nixon came across as stilted and boring next to the dynamic and youthful Kennedy. In many ways, TV back in the 60’s and Okapi’s efforts today served many of same functions and I would not put it past one of these guys to maximize that function to their advantage. To conclude, I came away with two key things in my long visit from the Congolese- particular rural ones: a) the listen to Okapi daily b) they are less likely to take gifts for votes this time around. And to be clear, I spoke to 1,000 people. This is rather striking for it portends we are headed to a more volatile election than we all might think- no matter what these “Happy 11” seek to do. I, from time to time, I read your blog and found your writing insightful. However, correct me if i' am wrong, I believe also that from time to time that your view mirror of the RDC political elites, NGO and Embassies people. As native congolese, leaving outside RDC for the last 2 decades, you may have a better reading of the RDC barometer than I do, but I feel you are over stating your point regarding the advantage of Kabila. If I was you, I will narrow the field to relevant candidates that I think will reach more than 5% of the vote. My list will have the following people. Among the aforementioned, only Tshisekedi, Kabila and Kamehre, I believe will be able to reach double digit. My bet is that Kamehre will not garner no more than 12-15% of the electorate vote. To follow my assumption, one has to understand the dynamic of election in RDC. There is the dynamic of big cities and there is the dynamic of the country side voting. Heterogeneous’ cities like Kinshasa, L’shi, and Kisangani vote is politics and personality driven sprinkled with regional and ethnic consideration. Whereas, the countryside vote is, mostly along tribal and regional lines first and secondly personality driven among a more homogeneous group. Therefore, to reach more than 15% of the vote Kamehre will have to win big in Sud Kivu, and Nord Kivu. He needs about 90% in his native Sud Kivu( 2,022, 960 electorates), and about 70% in Nord Kivu(3,003, 246.00 registered electorates), which I do believe will be a toll order. I expect Tshisekedi and Kabila to capture more than 45% in each province. Despite what the so called experts are saying, it will be for me a two way race between Tshisekedi and Kabila. Tshisekedi because of his popularity, aura and goodwill garnered fighting Mobutu regime, and joseph Kabila because of the control of the purse and the alliance with the what the Congolese call the “classe politique alimentaire” will be the top two vote getter. Here is my rundown and prediction. 1. Province Kinshasa(3,287,745 electorates) : chalks it to Tshisekedi, I think will get about 55 to 70% of the vote, despite a huge leaning Palu electorate in the District of Tshangu, Est of Kinshasa. That electorate will be key to Kabila strategy of weathering the storm in a city where he is deeply impopular. Kengo, Kamhere and Nzanga will be hard pressed to get more than 5% point each. 2. Province of Kasai Occidental (2, 661,245.00 electorates) Kashala could play spoiler to Tshisekedi vote. Kabila will do well in Evariste Boshab circonscriptions of Mweka, Luiza, and around Ilebo, most likely propelling him to reach 500, 000.00 electorate votes 25 to 30%. 3. Province of Kasai Oriental(2,643, 905 electorale votes). Bastion of the Tshisekedi, He will win handily. Kabila hope will be to perform well in Katako Kombe, Lodja, Kole and Lomela( Tetela land). But, I don’t believe Kabila will be able to reach 25%. 4. Province of Equateur(3, 960, 643) Tshisekedi will win the popular vote, despite old antagonism toward Tshisekedi who was Mobutu “bete noire”. Nzanga and Kengo will do very well maybe 25 percent each. My guess is Tshisekedi will have at the end of the day the popular vote. 1. Province of Katanga(4, 627, 302 electorates ) Kabila will more than 50% of the vote. However, Tshisekedi, will perform very well in all majors cities like L’shi, Kolwezi, Likasi, Kipushi etc.. The key for him is not to fall below 30% to narrow the margin. 2. Province Of Maniema(874,909) Kabila will win around 60% of the vote. 3. Province Orientale (3,886, 524) Kabila needs to win big here in order to stay competitive. Tshisekedi needs to pay more attention and imperatively pay a visit as promised to keep will chance alive. 1. Province of Bas Congo (1,502,939 electorates) both Kabila and Tshisekedi will do well because of pariochal interest of Congo native. Moreover, because of its proximity to Kinshasa, Tshisekedi may be favored. Kabila alliance with Palu, will make him the favorite in the Kwango Sous Region, notably in Kahemba(106,155 electorates), Feshi(165, 226 electorates). How well Thsisekedi will perform in Kenge(2222,623), Popokakaba(91,339) and Kasongo Lunda(262,445), all yaka lands, will be key to him winning easily. All will depends to what promise he will give them. In the Kwilu sous region, Kabila will do very well in the Palu bastions of Gungu(303, 506) and Idiofa(482, 375). However, I will watch how Kabila will perform in Olivier Kamitatu’s mother commune of Bulungu(413,455.00) and his father bastion of Masi Manimba(369, 313). In addition to Bagata(165,539). He nneds to win big there to get Bandundu popular vote. The other sous regions of Mai Ndombe,(488,040 electorates), Plateaux (219,449 electorates) and Sous region of Bandundu ( villes of Bandundu and Kikwit, both (270,494) will remaim competitive areas for both candidates. The sous region of Mai Ndombe and Plateaux tend to mimick the voting trend of the province of Equateur. I expect all three sous region to be very competitive. - Power of purse , control of the media and how Kabila people will be tampering with election result. - Is UDPS will be able to have enough resource to make Tshisekedi available in Province Orientale, The Kivus and Bandundu. - Will the CENI accepts to open the election role in order flush out duplicate role, under age voters and by the same token guarantee a peaceful election? - Finally the fact the parliamentary is not contested with the presidential will make it harder for Kabila hired guns to mobilize vote for him? Like they say in lingala: ekozala opesi mbwa, mbwa aboyi. Meaning even dogs will refuse to eat that food, or poke their nose in that business. I believe another unknown here is a particularly important player of Kabila’s “base” that is not running. Moise Katumbi, the ridiculous popular governor of Katanga and owner of a revered Congolese institution- the soccer club TP Mazembe that is to date the only African soccer team to make it to a FIFA World Cup finale. Without the East and Katanga, Kabila has no chance whatsoever. And it is clear that is popularity in the East has collapsed which makes Moise that much more important to a victory. Well, at Kabila’s widely panned speech at his farm the other day, Moise was conspicuously absent. More problematically, there was the prison break last week (nearly 1,000 escaped, including a violent warlord)and just yesterday a major circuit breaker at the power substation that provides Katanga’s most important city- Lumumbashi- blew up throwing much of this relatively peaceful and prosperous city into darkness. Radio Okapi has the scoop and Moise, after repeated efforts to fix the substation went unanswered, is pissed. I really fail to see how Kabila could smooth this over with Moise. As we all know, Katanga is mission critical to any politician in the Congo. Most of Kabila’s inner clique hail from the region. If there is a king maker in the Congo its mostly him at this point. Thanks once again for such an interesting thread. I was captivated and well informed with the posting submitted by Mwana Kin. I did like the way you dodged a question on what candidate you are going to vote for! I wanted to point to the fact that most of what is being said here about the elections is mere speculation. The biggest uncertainty about the outcome of the 2011 elections is to do with the fact that no one objectively measure the size of Tshisekedi electorate. I know 'Gu'estimations can be made about J Kabila's electorate based on his 2006 results and it is obvious that Kamerhe's departure from PPRD did not occasion significant subsequent departures amongst J Kabila's loyalists at least at the leadership level. As far as tshisekedi is concerned, I can vividly remember my UNIKIN years when I was a fervent UDPS member within both the University and the Home 30 (Soweto) section. Looking back to that period, I can recall how tshisekedi’s popularity reached its peak around early 1990s (Lititi mboka UNILU, numerous students demonstrations against mobtu, Bindo & Nguma promotion, pillages, Conference nationale Souveraine, operations villes mortes etc...) before falling to almost nothing with AFDL arrival, and the rise of L D Kabila's popularity. Like me, many students of that era and indeed Congolese of my generation and beyond started to question political positions taken by tshisekedi with L D Kabila’s arrival and, to me, it was obvious that I gradually got disappointed with thsisekedi's numerous faux-pas (no need to list them here). In other words, it looks to me that tshisekedi's political life has been about consolidating mobutu's dictatorship and extending that regime’s life expectancy. I have good personal reasons not to vote for Kabila (and I’m sure Jason you can guess one of them) but when I look at what the generation of my parents (people born between the two World Wars) has bequeathed to us. I may be wrong but I have no doubt that none of them (except martyrs and heroes) should ever be allowed to run that country again. I also say this because, 51 years gone since the independence of 30 June 1960, history and the world will forever remember that the D R C is to have only 3 (three) democratic elections (out of a possible 10). 2 (two) out of the 3 (three) elections are to be held under the current leadership or in the last 5 years. I know things are far from perfect but I am convinced that Congolese politics from my parents’ generation should either completely retire from politics with immediate effect or work in the shadow as advisers to a much younger and open minded generation. This is just an opinion and I wellcome to critics. Finally the fact the parliamentary is contested with the presidential will make it easier for Kabila hired guns to mobilize vote for him? If you want to have a measure of Tshisekedi electorate, look at the December 2005 constitutional referendum voter turnout. Do you know what was the turnout or participation rate in both Kasai, Kinshasa and Bas Congo when Tshisekedi issued his call for boycott?. Kasai oriental was 33% of eligible voters. If you exclude the songye and Tetela territories (were turnout was in the 84%), the effective turnout in Luba land was less than 5%. Kinshasa was 46.8% and Bas Congo was less than 50%.etc..
Let’s take a look now at Kabila first round and second round results at the same areas. Kabila lost in all western part and central part of the country. In order to win need to keep his number close to 2006 first round number. I have doubt that he will do so. Remember what Kamhere said, He does not see where Kabila will get 40%. I do agree with Kamhere on this one. I don’t see Kabila winning the Kivus. He may win here and there In Nord Kivu, like in Masisi and Nyirangongo, But I doubt about his strength in Goma Ville or in Beni, Butembo, and/or Walikale. Moreover I don’t see him getting 70% again in province Orientale because Tshisekedi is not Bemba, who was hated in Province Orientale because of the rebellion. So, When Tshisekedi said that he will win big, it may seem like braggadocio, but underlying Tshisekedi swagger, is the analysis of the number and understanding of the Congo geo politique. I am struggling to understand how you managed to attribute the 38% or so abstention rate for the 2005 Constitutional referendum to Tshisekedi's call for a boycott! Can you please explain the method used to come this such a conclusion? It is true that tshisekedi's call to boycott the 2005 constitutional referendum may have had some effects in certain provinces; but I am not convinced that this particular abstention rate is a reliable indicator of anyone's electorate. Your analysis on province Orientale can be extended to the fact that it is getting increasingly clear that Bemba will not ask his supporters to report their votes on tshisekedi. From what I am hearing it looks like the gap between the two individuals continues to increase and that Kamerhe is moving in quick to make an alliance with MLC. If this materilaises then tshisekedi wil struggle to secure some of the votes in the West hence giving J Kabila a chance to top up from any loss in any of his traditional electorates. I genuinely think it is tight but given that the opposition is still devided, any such division is only helping J Kabila to compensate from any loss made in his traditional electorate, let alone winn new ones in hostile electorats. Kengo..kengo...kengo...yes, I know and you can all laugh if you want . But here is the truth;there is no one in this list of candidates who know this country better than "le premier de premier". He has deep pocket, a network(national and international)and the catholic church. I don't say its a done deal but as some congolese political analyst said ; whoever he's going to be able to mobilize his people(electorate)-the ground game-then this person should be the favorite.He knows something which all of us don't ...thats why i'm not counting him out. He's on the race because he thinks he can pull it off and don't forget this is Kongo(drc) we are talking about...where everything is possible.